Glen Campbell, the acclaimed country artist and star of television and the movies, died August 8, 2017. In a show business career spanning 50 years the native Arkansan sold 45 million records, sang such Top Ten classics as “Galveston,” “Wichita Lineman,” “Gentle on My Mind,” and “Rhinestone Cowboy,” hosted the hit show “The Glen Campbell Goodtime Hour” on CBS from 1969-1972, and starred with John Wayne in “True Grit” and Joe Namath in “Norwood.” Along the way, Campbell played guitar for the Beach Boys (filling in for Brian Wilson) from December 1964-March 1965, was married four times and fathered five sons and three daughters, and received enshrinement in the Country Music Hall of Fame in 2005. Diagnosed with Alzheimer’s in 2011, he went on a “Goodbye Tour” with three of his children in the backup band. Campbell gave his last performance in Napa, California on November 30, 2012. The documents being shown include Campbell’s letter to President Clinton and the response of the Chief Executive. He playfully refers to Clinton and himself as “a couple of good ol’boys from Arkansas” paired with two Presidents. 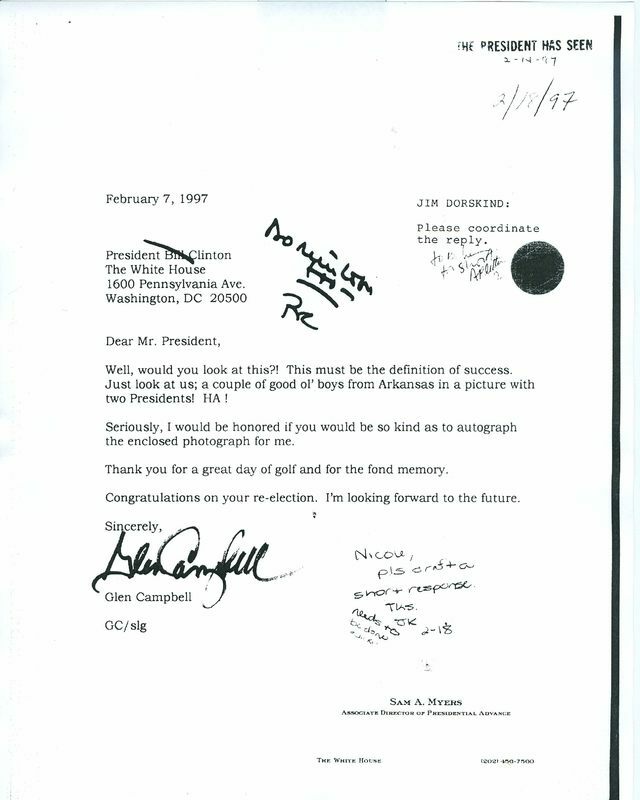 Respectfully asking for Bill’s autograph, one of country’s biggest stars in the 1960s concludes by fondly remembering a “great” round of golf and congratulating a fellow southerner on his re-election. Clinton answers by wistfully recalling the “golf outing” and saying it probably would be highly unlikely the foursome could be brought together again. The photo features in order President George H.W. 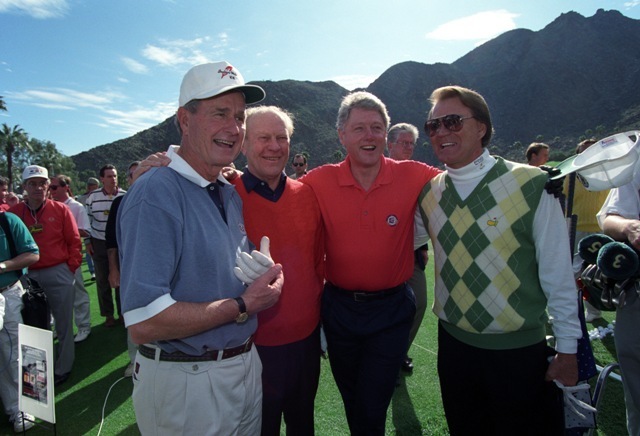 Bush, President Gerald Ford, Clinton, and Campbell. Campbell was 58 years old at the time. 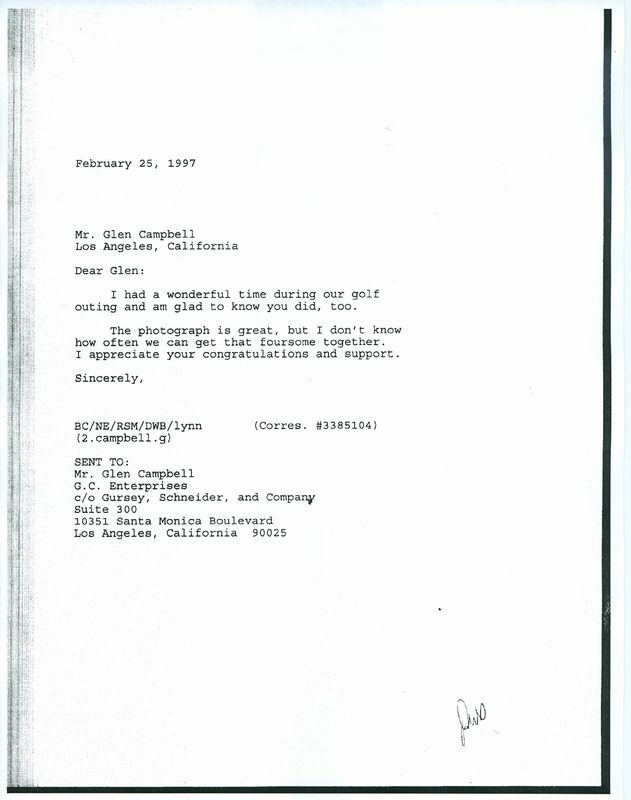 Although the correspondence is dated February 1997, the picture of the four men was actually taken two years earlier at the Bob Hope Chrysler Classic in California on February 15, 1995. An experienced golfer, Campbell served as the celebrity host of the Los Angeles Open, a regular stop on the PGA Tour, from 1971 to 1983. 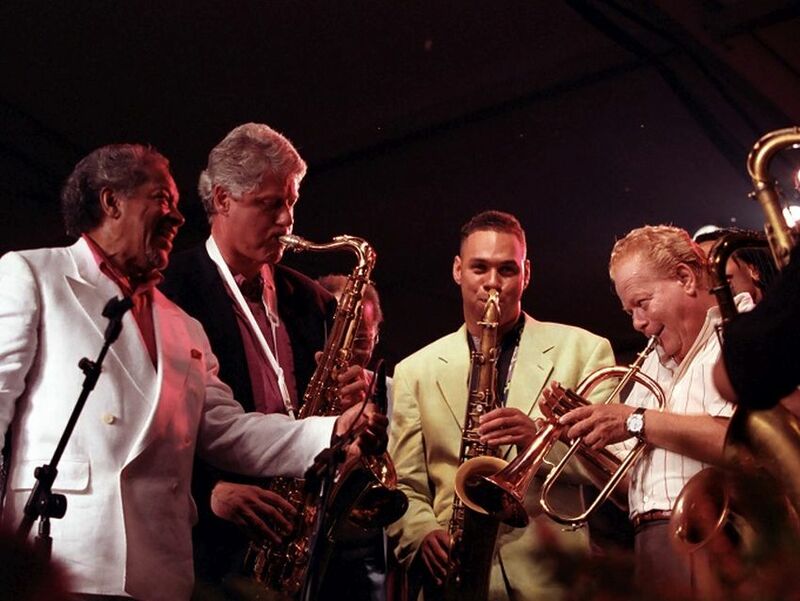 The documents and photo are courtesy of the Archival Department of the Clinton Presidential Library and Museum.